Filled with a labyrinth of canals and interesting Flemish buildings, Bruges is a fairy-tale like city that begs for photographs. During our visit a few months ago, I took more than 300 photos after we stepped off our hour-long train journey from Brussels where we spent Christmas. Like Venice, Bruges is filled with small canals and was known for its high-quality lace. 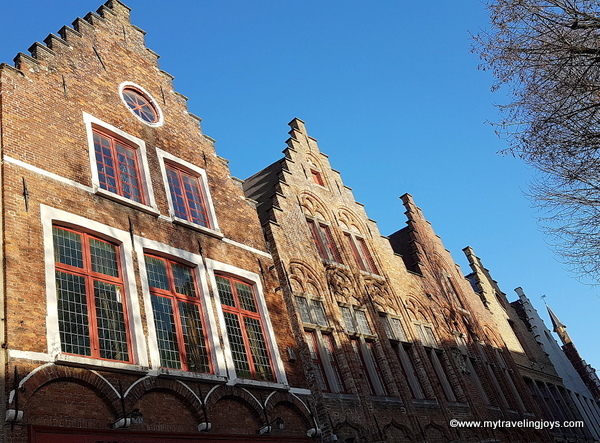 During the 16th century, this Belgian city prospered becoming a hub for commerce with merchants from 34 different coutnries that regularly traded here. 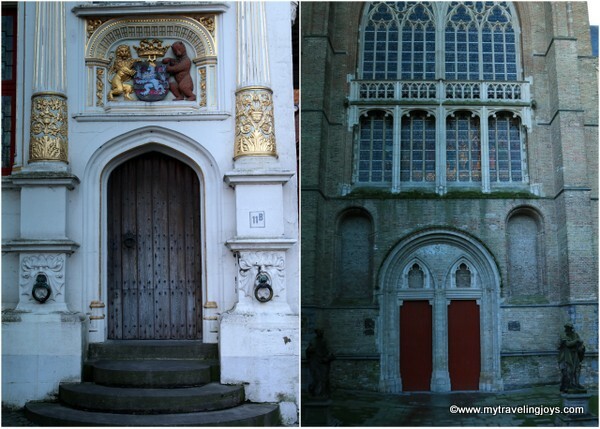 Even if you’re not one for historical details like these, grab your camera and head to beautiful Bruges! Shortly after we stepped off the train, this gorgeous reflection of a restaurant located along Minnewater "lake of love" greeted us in Bruges. 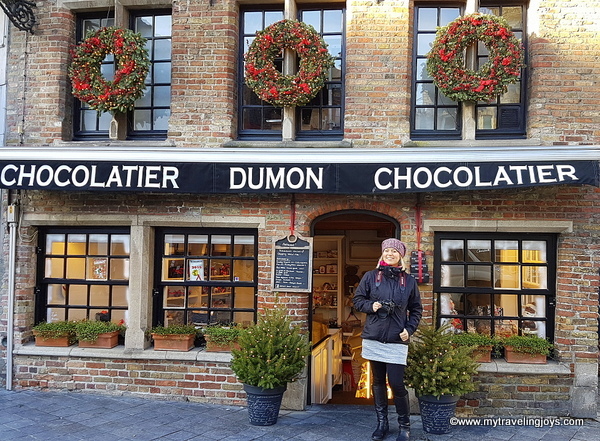 After a short walk from the train station, we first stopped at the Begijnhof or Beguinage – a tranquil convent garden and museum that was founded in 1245. 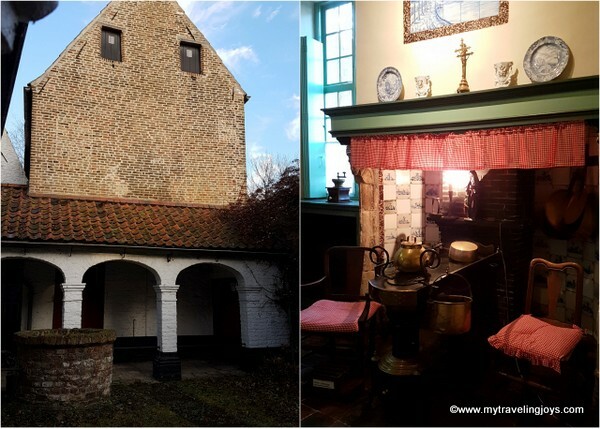 This little piece of world heritage was once the home of the beguines, emancipated women who chose to lead a pious and celibate life. Today the beguinage is inhabited by nuns of the Order of St. Benedict and several Bruges women who have decided to remain unmarried. In the Beguine's house which is now a museum, you get a good idea of what their day-to-day, simple life was like in the 17th century. Next, we explored The Holy Savior Cathedral (Sint-Salvatorskathedraal), which was originally founded in the 10th century as a common parish church. In 1834, shortly after Belgium’s independence in 1830, a new bishop came to Bruges and the Sint-Salvator church obtained the status of cathedral. The cathedral’s oldest surviving part, dating from the end of the 12th century, forms the base of the mighty tower which you can’t miss from our next stop. Though the church is undergoing some renovations, it’s worth popping in. Standing 83-meters tall, the Belfry of Bruges is arguably the most famous part of The Markt square and one of the city’s main attractions that has a queue. 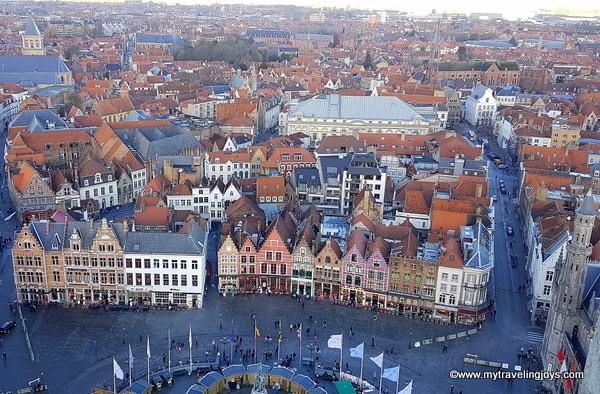 We waited more than 45 minutes to climb some 360-plus steps for an unparalleled view over the red rooftops of the city and the market square, which is dotted with many restaurants and cafés. Today, the tower holds the 47 bells designed in 1741 by George Duméry and regularly chimes the hours and important events. Lunchtime means you must grab a waffle from one of the many stands or shops located near the square. This Gothic structure was built in the late 1300s, making it the oldest Town Hall in Belgium and also an ideal courtyard to enjoy your waffle. The reasonable 2.50-euro admission fee is worth paying so you don’t miss the ornate Gotische Zaal (Gothic Room) – featuring wall murals of Bruges’s history. The spectacular vaulted oak ceiling dates from 1402. Tip: go early so you can avoid too many people in your photos. The Quay of the Rosary is one of the most photographed sites throughout the entire city of Bruges. Just around the corner from the Town Hall, you’ll find a lovely canal with swans and crow-stepped-gabled houses and boats sailing by you. No matter what the season, I’m sure the Rozenhoedkaai is picture perfect! 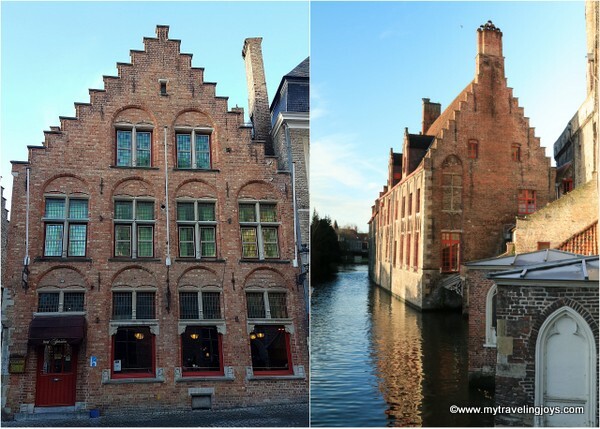 Of course, when we weren’t admiring the gorgeousness of Bruges, we found a few pubs to enjoy a Belgian beer, an order of frites with mayonnaise and a few Christmas markets. We enjoyed ourselves so much that I have to wonder why my Belgian friend seemed to downplay her city when she spoke of her hometown. 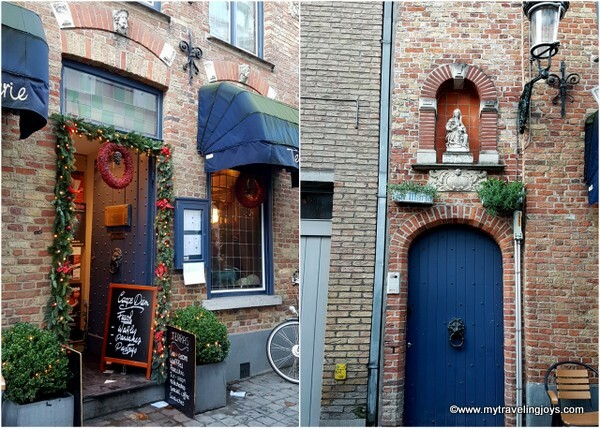 Grab your camera and let’s head to Bruges! Awesome pictures and blog post. Looks like an amazing place to visit. Glad you had a great time exploring. Such an under-rated country. I love the food too. simply one of my favorite places! did you eat waterzooi? You are spot on, it's a fabulous city - nearly as fabulous and intoxicating as the 'Monk' beer! Lovely reminder of a long-ago visit.